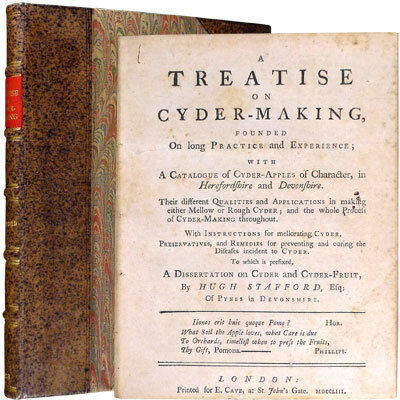 A Treatise on Cyder-Making, Founded on long Practice and Experience; with A Catalogue of Cyder-Apples of Character, in Herefordshire and Devonshire. Their different Qualities and Applications in making either Mellow or Rough Cyder; and the whole Process of Cyder-Making throughout. With instructions for meliorating Cyder, Preservatives, and Remedies for preventing and curing the Diseases incident to Cyder. To which is prefixed, A Dissertation on Cyder and Cyder-Fruit - Hugh Stafford, Anonymous 1753 - Printed for E. Cave, London - First Edition	Legendary and rare first edition of this anonymous work, all of which is generally but erroneously attributed to Hugh Stafford who contributed the sixteen page ‘Dissertation on Cyder and Cyder-Fruit’ at the beginning. An influential work, Benjamin Franklin, who was partial to a drop himself, ordered three copies to be reprinted as pamphlets and distributed amongst the New England farmers after failing with their vineyards. It was plagiarised into various publications including encyclopaedias, cookbooks and later reference works related to cider. Provenance: Joseph Carless (1842-1909), naturalist, JP and Mayor of Hereford, a centre of British cider making, with his illustrated bookplate ‘Veritas de Terra Orta Est’ and ‘If thou art borrowed by a friend right welcome shall he be To read, to study, not to lend but to return to me’ [Reference : Cushing/Whitney Medical Library, Yale]. Later ex-libris of E. D. Nicholson, of Oswestry, Shropshire. Small booksellers plate of The George Gregory Booksellers, Bath (1846-1924). Pagination: Quarto (binding size 20.8 x 16.5 cm, page size 19.7 x 15.9 cm) pp. [2 (blank pages added by binder)] [2 (title, and blank verso)] iii-v (’Preface’) [3 (’The Contents’ and ‘Errata’)] 68 [46 (blank pages added later by binder for thickness)]. Trimmed to lower edges, not affecting the text apart from the last line on the title page (should read ‘[Price Two Shillings.]’. Sections: Preface (iii-v); A Dissertation on Cyder and Cyder-Fruit, By Hugh Stafford, of Pynesin Devonshire, Esq. - In a Letter to a Friend; bearing date 1727’ (1-16); A Treatise on Cyder (17-61); A Supplement ‘Containing some directions omitted in their proper places (62-8). Later editions noted – 1755 ‘Second Edition with Additions’. Printed for D. Henry, and R. Cave, at St. John's-Gate. [64pp]; 1769 ‘A new edition with additions’. Printed for F. Newbery, at the Corner of St. Paul's Church-Yard [iv,64p]. On Benjamin Franklin and ‘A Treatise on Cyder-Making’ – from Webster’s West Hartford History (web 2017). Around 1745, Benjamin Franklin penned these draft lines of a song on the virtues of drinking. “October” refers to hard apple cider – in that month the apple orchards growing on every farm began to drop their fruit, and farmers carted them to the local mill to process them into cider.